In the new filing, Apple calls attention to its rival’s use of “Amazon Appstore” to market the Kindle File which was announced in September. 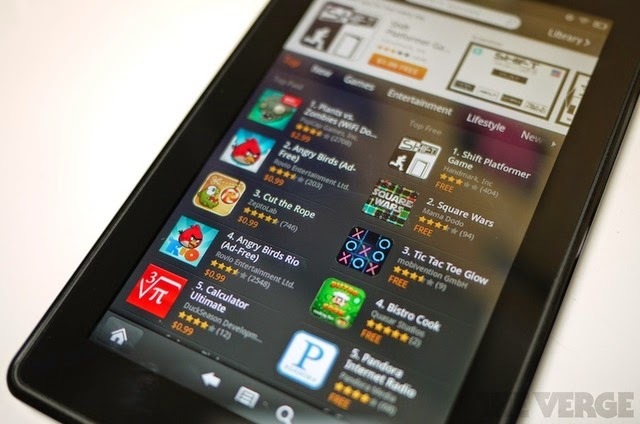 Apple had filed its original complaint last spring after Amazon used the phrase “Appstore for Android” to publicize its phone-based app store. Apple has now also tacked on a new false advertising claim to its earlier allegations of trademark infringement and unfair competition. The complaint (link after the break) also contains pictures of both advertisements. The revised claim comes at a time when the Kindle Fire is threatening to be the first serious disruption of a tablet market that, so far, has been overwhelmingly dominated by Apple’s iPad. Persuading consumers that it has the only “app store” may be part of Apple’s strategy to retain market share. Apple could face an uphill battle, though, in convincing a court that it can own “app store.” When the lawsuit was first reported last spring, Apple’s claim was met by controversy and even ridicule by people who said the phrase was a generic term like drug store that no one could own. It probably didn’t help Apple’s case that “app” was named the 2010 word of the year by lexical societies and that Steve Jobs was reported to have used the phrase “app store” in a generic fashion. The company is still waiting to learn if the Trademark Office will grant its application for a trademark. Microsoft has registered a formal objection. Although a claim to own “app store” might strike some as far-fetched, Apple has long been a master of using different forms of intellectual property to wrap a legal force field around its products. In its high profile patent campaign against Samsung, for instance, Apple has not only accused the Korean company of infringing its utility patents but also its design patents and trade dress as well. Trademark cases, like the app store one, can require a court to decide where a name fits along a five-part distinctiveness scale. Names that simply describe a product like “Cooked Tomatoes” are considered “generic” or “descriptive” and will receive less protection than so-called “fanciful” names like Xerox or Oreo.